Fire up the oven to 375 degrees. While the oven is heating, spray a 12-cup muffin pan with non-stick cooking oil. Spray a good size skillet with non-stick oil and heat over med-high heat until warm. Add the ground meat and onion. Cook until meat is brown and onions softened. About 10 minutes. Turn burner heat down and add BBQ sauce into the meat/onion. Simmer 5 minutes. Remove from heat and set aside. Time to make the pastry cup. Roll out seamless dough sheet. You want it the size of a cookie sheet. Once rolled, cut into 12 squares placing one square into each muffin cup. Press down and along the sides to form a cup. It doesn’t have to look perfect. The idea is to form the dough so that it will hold the meat filling. 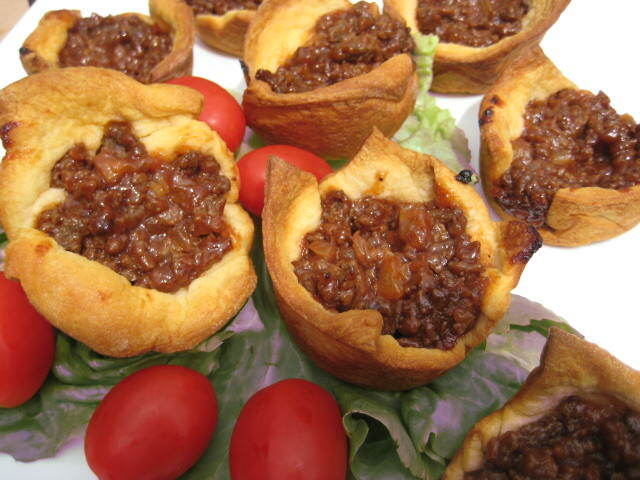 Once dough cups are in place, fill each one with the BBQ beef mixture. Bake in oven for 13 minutes. Don’t overcook, you want a nice golden pastry crust. Every oven is different so the bake time given is just an average. You’ll want to serve these up right away. Let them set for a few minutes and then plate and serve. TIPS: Prepping the muffin dough cups is the most time consuming part of this dish. Once you’ve made your first batch, you will get faster at forming the dough cups. I make the beef mixture in advance and freeze. While the beef is defrosting in the microwave, I prepare the dough cups. Cuts prep time by 10 minutes. The entire main course takes about 25 minutes from start to finish when you cook the meat beforehand and freeze.